AiAi shows us how its done! Sega has finally announced a version of its sublime Super Monkey Ball that will work with the Wii Balance Board. And if you don't find that news just cause for celebration, then you are surely dead inside. 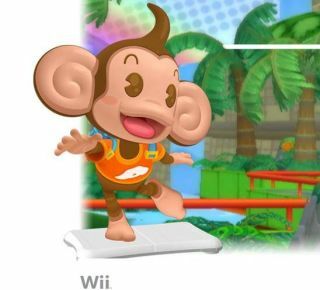 Super Monkey Ball Step & Roll will be out in early 2010 and Sega has released a teaser video that shows (our favourite character) AiAi cautiously learning how to use the Wii Balance Board to control himself in the gameworld. TechRadar has contacted the publisher for further details on how the game will work (and whether or not you will actually need to own the Wii Balance Board to play it or whether it can also be controlled using Wii Motion Plus). Expect lots more news on this (and much more) from Sega and the cream of the UK's games developers and publishers from next month's GamesCom show in Cologne.